When your name is Can-Do there’s a certain expectation you will live up to that name. The Can-Do Kitchen, the area’s first food business incubator, is ready to show the community what it can do now that it’s moved into a larger space and what it hopes to achieve next. For the past five years, the Can-Do Kitchen has shared space in the People’s Food Co-op building with the PFC deli. Soon after the two moved in together, the deli business grew to the point that it was routinely using one of the two cooking stations available. Both the deli operation and the number of Can-Do clients continued to grow. So about 18 months ago, the Can-Do Kitchen started a search for a location that would have more room for its clients. “Oddly enough, there aren’t that many commercial kitchens out there,” Can-Do Kitchen executive director Lucy Dilley, says with a chuckle. Earlier this year, it found a space at 3501 Lake Street. It’s still sharing. This time with C&M Catering. C&M uses the space from 6 a.m. to 2 p.m. and then is out at catering events. That leaves a lot of time in the 24-hour operation of the kitchen for Can-Do clients to get their cooking or baking done. Dilley expects the kitchen will be able to increase the number of companies it assists in the new space considering it has gone from a 1,300-square-foot space to one with 2,500 square feet and access to two separate stations. “We can have two companies working at one time,” Dilley says. At its previous peak, usually in summer during Farmers Market season when food companies are getting their products in front of market goers, the Can-Do Kitchen served about 25 clients and has consistently had at least 15 clients. The move to Lake Street was in part possible because the Co-op purchased equipment from the Can-Do Kitchen. Cabinets and the color scheme came with Can-Do to the new site. Since then, C&M Catering has been very helpful in explaining its equipment and sharing the space, Dilley says. Moving its physical location is only one move made this year for the Can-Do Kitchen. In April, it received its 501c3 status as a nonprofit. It formerly was a project of Fair Food Matters; the two organizations separated in January. “By becoming an independent nonprofit organization and moving into the new space, the Can-Do Kitchen has more capacity than ever to serve our community by working to increase the availability of local food products and removing barriers to help small food producers succeed,” says Bailey Mead, board treasurer. 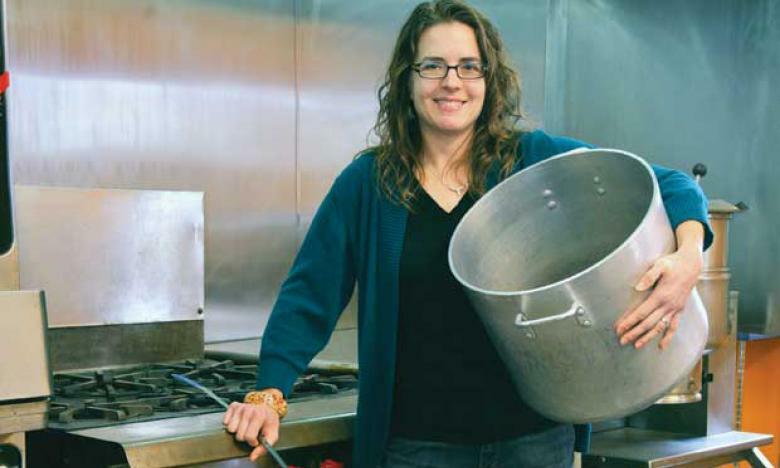 The Can-Do Kitchen has launched a lot of businesses since its beginnings during the summer eight years ago when clients used the kitchen in a trailer on the Kalamazoo County Fairgrounds to get their start. Then, two years in the kitchen of First Baptist Church preceded the move to PFC’s new building. Through the recent changes, the kitchen tried to keep the disruption to its clients to a minimum though the kitchen was shut down for nine days as the move was made and the state licensed its new location. The services they offer will not change with the move, though some are evolving as the kitchen gets more assistance with translation in meetings with clients for whom English is a second language. Spanish and Mandarin translators are now working with the kitchen. What else does it mean when it says it is working to remove barriers for small food businesses? In weekly meetings with clients, the Can-Do Kitchen staff goes through requirements for food safety and labeling. It helps clients understand branding and why it’s necessary. It assists them in making connections with the Small Business Administration for its financial planning expertise. There’s a lot of marketing advice, from how to approach buyers, how to get the most out of sampling events, and how to break into markets with well-established brands. An advisory board of six members in various parts of the food industry or with knowledge of the business also assists the fledgling companies. And Can-Do Kitchen staff works to make sure the new business owner knows who to connect with for their business to grow. Even though the Can-Do Kitchen just moved into its new location, the organization recognizes this is an interim space. Eventually, it wants to have a location with space not only for cooking, storage, and offices but room for classes and other aspects of the educational side of its work. A capital campaign to raise funds for its own location could be in the works. Dilley does not yet have a timeline for such a fund drive as there is some preliminary work that needs to be done. The Can-Do Kitchen board of trustees needs to grow from its current size of three members. Strategic planning to further identify the needs the kitchen should serve will also be done. Then again, one need she already has identified is assistance for businesses that have outgrown the incubator kitchen but are not ready to move into their own production facility. Dilley says food business incubators across the country are realizing the need for some kind of assistance for businesses making the intermediate step. “We’ll need a variety of people at the table to figure it out because it will take outside the box thinking,” Dilley says. These are clients currently working in the Can-Do Kitchen. The Adventures of Barb & Tammy--They make eight varieties of premium home style granola: Cherry Pecan, Just the Berries, Apple Spice and Everything Nice, Nutty Maple, Hazelnut Chocolate Cherry, Lemon Kissed Berry, Ginger!....Honey!, and PB&J. It also offers two nut mixes--Fruit and Nut with three fruits, three nuts, and dark chocolate chips, and No Regrets, which has almonds, walnuts, blueberries, apricots, and dried plums. Barb & Tammy biscotti flavors are: Cranberry Pecan and Lemon Pistachio. Ageless Pantry--Ageless Pantry L.L.C., is a family company. It’s Zenuine Brew teas are adapted from recipes the founder’s family has enjoyed for generations. Its goal has been to bring customers herbal teas made from the highest quality organic and natural ingredients. Crazed Cravings--Makers of salsa, Bloody Mary Mix, and gourmet chocolates. Crazed Cravings offers recipes, support, and a place to upload your crazed creations to share with the company, and the snacking community. DoughChicks--This mother and daughter team create tasty, nutrient dense, and convenient food for busy and active people, including the Chia Crunch, Midnight Crunch, and Kara Comet.The latter is made from raw natural ingredients including gluten-free oats and cocoa. Fizzy Bread & Dips Co.--With a 12 oz. carbonated beverage and a bag of Fizzy Bread mix, the company say deliciousness is inevitable. Use any type of beer or soda pop to create a flavored bread of your choice. They also have four kinds of dips for that freshly baked bread. Kalamazoo Pickle Company--When Derek Richmond and his daughter sampled 15 different brands of pickles and were disappointed with all of them, they decided to make their own. In April, their first pickle, the Richmond, became available in limited quantities at Water Street Coffee Joint locations. Kzoo Brain Food--In 2002 Jesse Forbes, in a nearly fatal car crash, broke her neck, fractured her skull and was in a coma for seven day. Remarkably, she had an extremely rapid healing process and swift rehabilitation that doctors accredited to her healthy lifestyle. She came out of it determined to help others live well. Her Original Brain Food Walnuts and Brain Food Seasoning is part of that plan. Mamaleelu Cold Brew--High quality, organic, fairly traded coffee is used to craft Mamaleelu Cold Brew. “Cold brew”, also known as “cold press”, is brewed without heat over a long period of time. The company’s small batch, hand crafted Cold Brew begins by steeping freshly roasted coffee in room temperature water for 18 to 24 hours, using a double filtration process to procure the end result: a smooth, buttery, balanced brew with a low acidity. Mike’s Famous Michigan Bean Dip--Produced by Kalamazoo’s Clara’s Kitchen by Michael Kruk, who got his start offering his bean dip to friends at parties and potlucks He got serious about making it for retail with the assistance of the Can-Do Kitchen. Perfect Blend Coffee & Desserts--Company owners say when you combine the soothing blends of unique coffees mouth-watering desserts, you have a Perfect Blend. It offers a variety of blended coffee recipes to create a unique taste. Some of our blends have Biblical names which provides the company with a way to evangelize and share the gospel of Jesus Christ. Season for a Reason--The company creates handcrafted seasoned salt. It likes to describe its products as "salt with a kick." They encourage customers to try it on anything you would normally put salt on. See the article in Women's Lifestyle Kalamazoo on our program and some of our clients here. KALAMAZOO, MI – Fair Food Matters' Can-Do Kitchen, a Kalamazoo-based incubator for commercial cooking and those trying to work their way into the food business, is taking steps to become a stand-alone operation. "After seven strong years of supporting entrepreneurs and a vibrant regional food system with Fair Food Matters, the Can-Do Kitchen is becoming a separate 501(c)3 non-profit organization," the directors of Fair Food Matters wrote in a statement Monday. The Can-Do Kitchen, a program of Fair Food Matters, expects to relocate in 2016 from about 1,400-square-feet of space it uses at 511 Harrison St., and expand in a two-step process. The kitchen is on the north side of the People's Food Co-op building, which has a separate 507 Harrison St. address. "We will relocate to a larger interim kitchen facility that will allow us to do all the things we are already doing," Lucy Dilley, program manager of the Can-Do Kitchen, said of supporting food businesses. "And in two to three years, we will move to a place where we can expand." She said the kitchen needs more room for cooking, baking and packaging. It also wants room for teaching stations, workshops, events, and links with food hub and farmers' market activities. Dilley said the kitchen has been growing and hopes to find a permanent home with about 3,000 to 5,000 square feet of space. The People's Food Co-op is also growing, she said, and could use the space now occupied by Can-Do Kitchen inside the 6,500-square-foot building it opened in 2011. Opened in 2008, the Can-Do Kitchen leases licensed kitchen space and basic kitchen equipment that new and existing food entrepreneurs can use to produce food products for sale. It provides resources for start-ups, including help with marketing, commercial kitchen training, formulating a business plan and help with obtaining a food license. Started in 2001, Fair Food Matters strives to improve the physical, economic and social health of the community by improving access to healthy, locally produced food and by educating, connecting, and empowering interested people in the Kalamazoo community. Its key program is the Growing Matters Garden program, an experiential learning program at Woodward Elementary School in Kalamazoo. By separating the two operations, Dilley said, "We can focus on our more specific mission of helping food entrepreneurs and Fair Food Matters can focus on the Growing Matters Garden program." -50 products were produced each week in its kitchen and sold state-wide. -One client, Free Love Bakery, graduated into its own facility. The name of the business, a seller of gluten-free foods, is a reference to allowing people who want gluten-free products to be free to love food again. It is owned by Julie Fox, of Kalamazoo.